The National Hog Farmer blog ran a piece slamming the vegan butcher concept and calling it (get this) “unethical.” Unethical! That’s a funny choice of words for an industry that profits from the suffering and death of sentient beings. Nonetheless, the meat industry’s fear is a good sign: it means the rise of veganism in mainstream culture is threatening their bottom line. 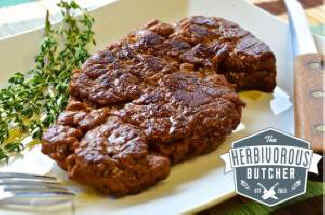 From Time magazine to the Huffington Post, the Herbivorous Butcher is popping up in media outlets everywhere. Started by brother sister duo Aubrey and Kale Walch, the all-vegan eatery in Minneapolis, Minnesota held its official opening last weekend. Launch day saw lines down the block and two-hour wait times. Customers snapped up cruelty-free versions of Italian sausage, smoky BBQ ribs, pepperoni, and lots of other plant-based goodies. A NowThis video about the shop’s first weekend has already earned more than five million views. Unethical! That’s a funny choice of words for an industry that profits from the suffering and death of sentient beings. Nonetheless, the meat industry’s fear is a good sign: it means the rise of veganism in mainstream culture is threatening their bottom line. Clearly, consumers are open to new approaches to their favorite products. Why eat animals when you don’t have to? Innovation and compassion are taking center stage, and the results are totally delicious.